mobiles – One Billion Hungry: Can We Feed the World? Africa is sometimes thought of as the last frontier to undergo an agricultural revolution. In a new edition of This is Africa produced in partnership with the Rockefeller Foundation, entitled Agriculture. Realising Africa’s Potential, contributors such as Jane Karuku, President of the Alliance for a Green Revolution in Africa, Judith Rodin, President of the Rockefeller Foundation and Dr Akinwumi Adesina, Nigeria’s agriculture minister discuss interventions and innovations that have the potential to transform the African agricultural sector. 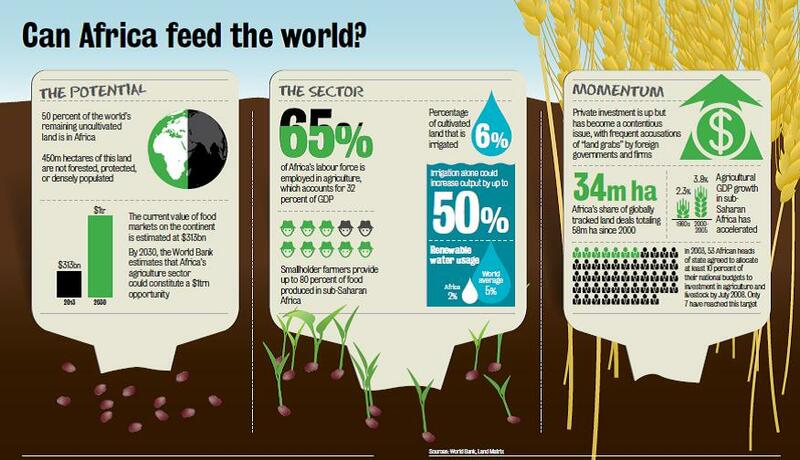 Calestous Juma has argued that, “Neglect of agriculture has been a defining feature of Africa’s economic policy over the last four decades.” But the situation is changing and there exists a lot of potential for African agriculture to develop, as indicated by the magazine’s infographic. There is renewed interest in agriculture by both the public and private sectors, in part because of the proven impact agriculture can have on poverty and hunger. The World Bank calculates that investments in agricultural growth are twice as effective at reducing poverty as investments in any other sector. Crop management, such as improved varieties and management techniques like the rice nucleus model pioneered by Olam Nigeria. Confronting catastrophes, such as the West Africa Seed Programme, which provides farmers with access to seeds bred to be more resilient under extreme weather conditions, or Oxfam and the World Food Programme’s R4 Rural Resilience Initiative in Senegal and Ethiopia, which helps rural communities to improve their management of climate-related risks to crops and livestock. Mobilising solutions from a tech revolution, such as mobile phones, which are now used to access financial services, insurance and market and technical information. Market movements, such as the Dutch Agricultural Development & Trading Company’s Autonomous Mobile Processing Unit (Ampu), which is a cassava processor that can be transported from place to place. Farmers whose fresh cassava crop could rot in one day can now process their harvest into cassava cake which can last up to 6 months, allowing them to wait to sell until prices are high. Going to scale. Innovations alone will not be enough. They must be combined and scaled, which will require political buy-in. This edition looks at several innovations in more depth, most notably local agricultural processing, commodity exchanges and financial products designed for the agricultural sector. As many of the authors point out though more must be done to reach smallholder farmers and to increase the reach of existing and new innovations.